Xenia is an ancient Greek term closely associated with the hospitality of a host shown to his guests, no matter how noteworthy or humble they may be. It was a term that Rev. Robert Armstrong suggested during a committee meeting of village leaders who were meeting to decide upon a name for their new town. It wasn't the first name tossed out, but it was the last when the Laticia Davis cast her tie-breaking vote for the unfamiliar term, but as the good reverend said, it best described his visit to the town and all the fine hospitality he received upon first arriving there. Laticia thought that was a pretty good reason to adopt the name. Another women of note was the former Xenia City Commissioner, Donna Groves. It was Donna's idea to transform as many old Ohio barns into something new and interesting. especially those barns sporting the "Chew Mail Pouch Tobacco" campaigns so common over the last 100 years. Donna thought it would be better if the barns were adorned with large unique quilt squares. Others agreed and now there are widespread efforts to create Quilt Barn Trails throughout not only Ohio, but all through the Appalachian countryside. Donna Sue Groves was credited with the Quilt Barn idea and became known as the "Mother of the Quilt Square Trail in American." In 2010, Xenia honored the hometown woman with her own quilt square in the new Xenia Station Park. The Green County Historical Society complex, showcases local history in a 3-building complex, including a 1799 log house, 1875 town house, and Carriage House museum with and museum store. 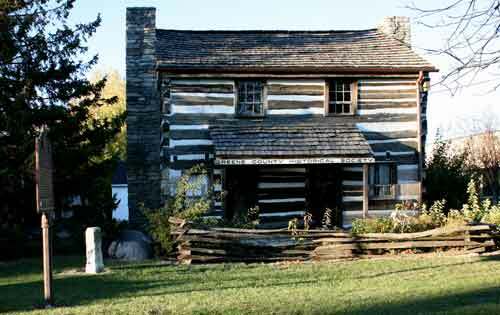 The log cabin belonged to local blacksmith, James Galloway, who first came to the area in the late 1700s. He built this cabin around 1799 and it was located along the bend in the Little Miami River. In 1936 the Greene County Historical Society moved the home to the corner of Second and Monroe streets, then to its present location in 1965. During the 1974 tornado, the cabin, like many homes in the area, was severely damaged. The damage has been repaired. Galloway, an Indian fighter, a companion of Daniel Boone, was the first treasurer of Greene County. His daughter, a remarkable young woman, is reported to have taught Tecumseh how to read English. 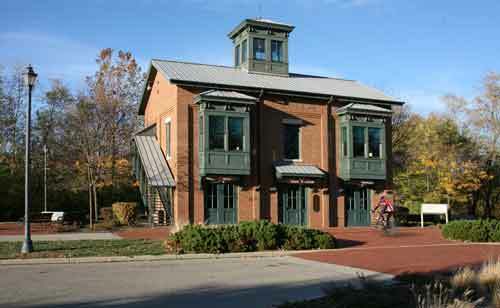 If you're into bicycling, then Xenia Station will be an important landmark for you. This is the hub to a number of bike trails that criss-cross the area and the state. Located on South Detroit Street (State Route 380) in Xenia, 1 mile south of the US Route 35 and US Route 68 intersection where the former B&O freight yards were located. The replica of the original telegraph office's first floor houses a local history museum which includes railroad memorabilia while the second floor has a classroom/meeting space. Xenia Station is also the hub for 5 regional rail trails, two of which are segments of the unfinished Ohio to Erie Trail, which will run from Cincinnati to Cleveland. In addition to the museum and classroom/meeting space, the building also has rest rooms, vending machines and water for the bicyclists, hikers and others who use the park. It also has a large map of the rail trails and the Hub Lookout, which is a tower accessible by spiral staircase that provides a panoramic view of the rail trails. In April, 1974 disaster struck the community. It wasn't the first time that a tornado had struck the city of Hospitality, but the 1974 event was definitely the worst. The tornado had maximum wind speeds of 300 mph, it destroyed 1,000+ homes, businesses, and 35 people died and 1150 people were injured in the violent storm. Fortunately, the tornado occurred an hour after schools had been dismissed. Today, Xenia has a wide spread Tornado Shelter system with signs clearly directing visitors and residents to the nearest Tornado Shelter.